While Clint Eastwood‘s stirring “Halftime In America” ad for General Motors has been the feel-good success story of the annual Super Bowl Look-At-Me Advertising Pageant (and Football Game)™, another car commercial is engendering more negative feelings. 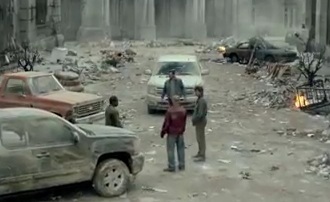 Chevrolet‘s post-Mayan Apocalypse entry “amusingly” posits that drivers of Chevy pickups stand a better chance of surviving such a catastrophe than Ford customers. Apparently, that’s a claim that can be challenged, says Ford. Aside from some odd details (I was amused by the shot of a newspaper headline, a likely source of satisfaction from my colleagues in the beleaguered print media), my overall impression of the spot was that, aside from the obvious message about the trucks’ durability, Chevy seemed to be promising its customers a short post-apocalyptic life consisting of, at best, fruitless masturbation, a diet of frog’s legs and Twinkies, and hours of fun keeping that dog at bay when the Kibbles and Bits run out. If Ford were really smart, they’d respond with an ad showing Ford owners in an underground bunker, happily repopulating the planet. Chevrolet’s “longest lasting, most dependable” claim is, to the extent it is legitimate, based entirely on longevity (as measured by full-size pickup registrations from 1981 to July 2011). However, the commercial, from its use of “Looks Like We Made It” to its reference to Dave’s tragic demise, communicates something very different – that the Silverado is safer and more durable than any Ford pickup truck. These two messages are entirely unsupported. With respect to durability, research from R. L. Polk & Co. shows that Ford has considerably more trucks on the road with over 250,000 miles than does Chevrolet, thereby demonstrating that Ford’s trucks are more durable than those manufactured by Chevrolet. As to the issue of safety, the 2012 Ford F-150 is an IIHS Top Safety pick, whereas the 2012 Chevy Silverado is not – having received less than impressive results in the IIHS side impact, rear crash and rollover tests. In light of the foregoing, Chevrolet has no basis to imply that the Silverado is either safer or more durable than Ford’s pickup trucks, yet that false claim is precisely what is conveyed to the consumer. As any post-apocalyptic survivor can tell you, side-impact performance is crucial. That’s where the inexorable rain of fire and ash always gets you. It is black letter advertising law that “expressly or implicitly disparaging claims can damage a product’s market share and, therefore,  such claims [must be] truthful, accurate and narrowly drawn.” See The Procter & Gamble Co. (Swiffer Dusters), NAD Case #4226 (9/14/04). As noted above, Chevrolet’s claims are neither truthful nor accurate. Thus, Chevrolet has absolutely no basis to disparagingly imply that, in the event of a catastrophic event, Ford’s pickup trucks and their respective owners will be reduced to ashes. I’m no advertising lawyer, so maybe I’m easily impressed by such chapter-and-verse. Time will tell if this actually goes anywhere, but if Chevy’s ad tells us anything, it’s that even if the courts don’t grant Ford any relief, it’s not the end of the world.